Recently, while I was browsing inbound links in webmaster tools, I discovered a link from the Huffingtonpost.com to one of my websites. For any SEO this is a very delightful surprise! Before I got too excited I decided to see if it was just another comment link that I forgotten about. I found this list of links at the bottom of the Huffingtonpost.com article. I not only believe tweeting my article got this link, but also writing a proper title tag for the bots to find it. 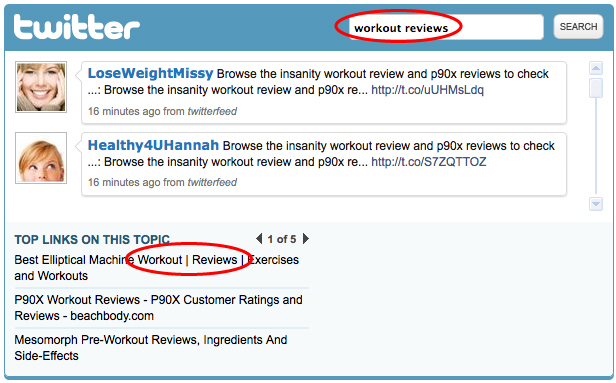 I wanted the exact match keyword “workout reviews” to be in my title because it had a high search volume. You can see my tricky use of the pipe symbol to make this work for human readers and bots. I believe this list of links in this article were auto generated based off of what a bot found when it searched for “workout reviews” in Twitter. I would be flattered if the author actually found me on Twitter and manually placed the link because my website is a great resource, but that is unlikely. Remember when writing title tags that you not only need to appease to the reader but you also have to be visible to search algorithms or bots.